"If you are interested in dramatically improving the operations and profitability of your company, your job stability, or the direction of your career read "In Pursuit Of Profits: How To At Least Double Your Profits Without Increasing Your Sales" and "Defy Mediocrity" by Derrick Welch. Owners, executives, managers, and employees from companies, both large and small, from virtually every industry are using these books to improve their skills and the operations of their organization. From companies who have purchased copies for every employee to Fortune 1000 CEOs, executives, and managers. From employees who want to stop worrying about layoffs and start thinking of promotions, to managers and business owners who want to dramatically increase profits and improve their cash flow without increasing sales." "The actions you take, or fail to take, today will determine the results you realize tomorrow." If you are a business owner the actions you take and the decisions you make now will determine the levels of profitability and success you will realize tomorrow. If you are an employee or manager the actions you start taking today will determine the levels of success you have tomorrow on the job and in your life. To reach your goals you merely need to take the right actions today, to make the right decisions now. Helping you reach your goals is exactly why I wrote "Defy Mediocrity. Choose to be Uncommon. 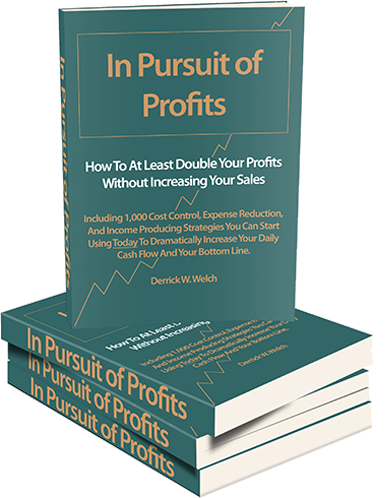 Think of the Alternative" and "In Pursuit of Profits: How to at least Double Your Profits Without Increasing Your Sales". In one of my books I wrote that “the seeds of dissatisfaction can produce a harvest of change”. This is undeniably true. But only if you take the right actions and make the right decisions today. If you are seeking ways to help make your company much more profitable so the company can help you reach your goals please take a few minutes and read more about these books in the main header above. If you are not satisfied with where you are in your career or your life please take a few minutes and read about both of these books in the main header above. Or just click on the links below to learn more or for instant downloads of the tools you can start using today to reach your goals. In addition in the Additional Resources section in the main header above you can order "Defy Mediocrity" as an actual book and as an audio book. 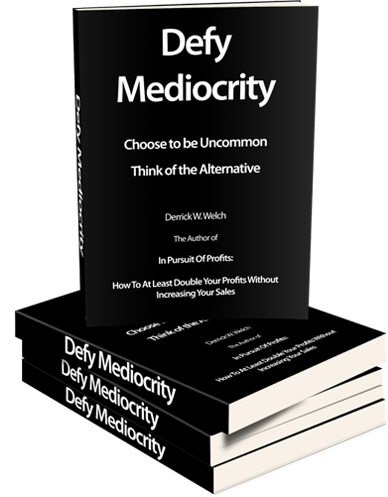 This is the only place you can order "Defy Mediocrity" as a hard copy book. Also in the Additional Resources section I have provided links to a number of other products that after careful review I have decided to recommend. Please take a look through these and click on the links for each for further information. To contact me directly please use the contact form below and you can also sign up for a periodical newsletter below as well. I do not sell names to others and I will contact you via email only if I have a newsletter to send you or a rare special offer you might be interested in.